The latest release in Diamond Select's new line of vinyl banks was a no-brainer. After all, if you were going to make an 8-inch bust featuring highly detailed sculpts and paint, what monster would you want to see done right? The Wolf Man of course! A Diamond Select Release! Sculpted by Eli Livingston! Howl much is in your bank? The Wolfman joins his monstrous brethren in DST's line of highly detailed, finely painted vinyl banks of Universal Studios" most famous movie monsters. 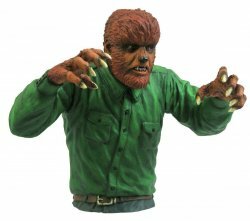 With a coin slot in his back and an access door in the base, this 8-inch portrait of the Wolfman looks like a collectible-quality bust, even as it takes a bite out of your spending! Also want the Metaluna Mutant Bust Bank? Click the convenient Buy Both button below! 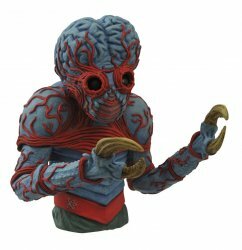 Diamond Select This Island Earth Metaluna Mutant Bust Bank - VERY RARE!